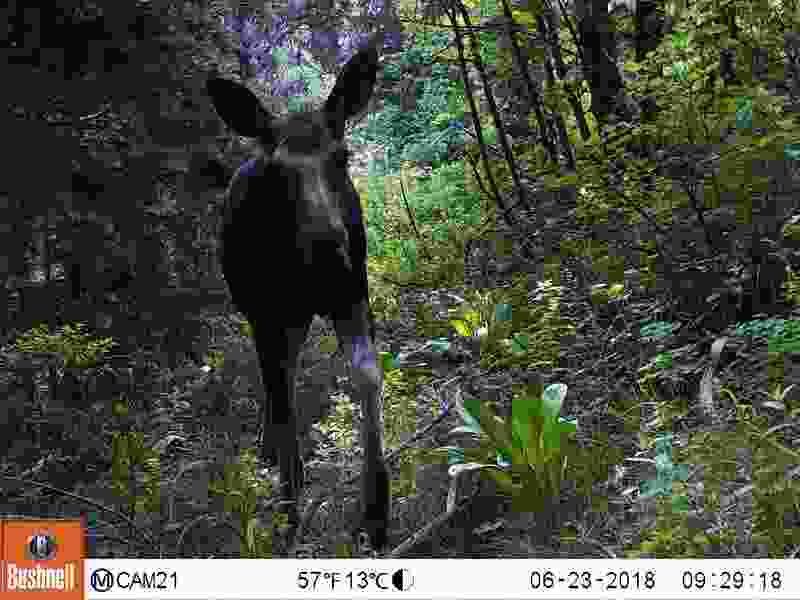 (Courtesy photo from the Wasatch Wildlife Watch project, University of Utah) A motion-triggered camera recorded this image of a moose in Utah’s central Wasatch Mountains June 23 as part of University of Utah research, led by biology graduate student Austin Green, exploring how recreation affects wildlife. Volunteer teams rigged cameras at 210 sites and recorded 40,000 to 50,000 images of animals during a 15-week study period. Now the team is seeking help from the public to process this tsunami of data. On the 20th day of the partial government shutdown, John Vucetich was proceeding as planned: doing a little packing and a lot of work on data sets related to the world’s longest continuous study of predators and their prey. On Monday, he is scheduled to embark on the 61st annual survey of moose and wolves on Isle Royale, an isolated island in the icy waters of Lake Superior. "What I'm doing right now is madly preparing for the winter study, because of course it could happen," Vucetich, an ecologist at Michigan Technical University, said Thursday. "It just might not happen." That’s because Isle Royale is a national park that is now inaccessible to Vucetich and his colleagues due to the shutdown, which has also hobbled other scientific work. The study — which mainly consists of counting moose and the wolves that prey on them, and observing their interactions — depends on winter conditions, and on a contracted helicopter that cannot easily be extended after the planned end date, he said. A shortened study period would amount to lower quality data, Vucetich said. "And if we are indeed unable to count wolves and moose this year," he added, "that will be a missing spot in the database forever." The shutdown might also interrupt a National Park Service-led project to relocate as many as 30 wolves to the Isle Royale, where wolf numbers have dropped from a peak of 50 in the early 1980s to just one highly inbred pair. The first four wolves were moved and released in the fall, and one later died; the Park Service planned to release others this month. The plan is aimed at restoring a predator-prey relationship that has long ebbed and flowed but is now severely out of balance: As of last year, there were 1,475 moose on Isle Royale and just the two wolves to control them. The moose population is now growing by 15 percent a year, Vucetich said, and they are devastating the island's vegetation. Moose first came to Isle Royale in the early 20th century, probably by swimming to it, and wolves arrived in the late 1940s by walking across an ice bridge from Canada. After its peak, the wolf population plummeted due to disease, and the moose mushroomed. The moose population has fallen and risen again since, while the wolves have struggled with inbreeding. The ice bridges that mainland wolves might use to move to the island, meanwhile, are forming less frequently due to a warming climate, the Park Service says. Scientists have been closely watching these dynamics for six decades. What does an abbreviated or missed survey matter in such a long-term effort? Maybe very little, Vucetich said — but maybe a lot. Vucetich compared the study to a watching a movie: If you miss a few minutes to get popcorn, you might come back and find it easy to follow along. "But if you miss the wrong two minutes, you'll come back and say, 'I have no idea what's going on,'" he said, because you've missed a key plot twist. "And two of the most important things we've learned on Isle Royale in 60 years are those kind of singular events," he said. The first was the collapse of the wolf population in the early 1980s, which was caused by the inadvertent introduction by humans of canine parvovirus, a disease that can also kill domestic dogs. The second was the migration of a male wolf that left Canada in 1997, traversed the iced-over Lake Superior, and "bolstered pretty importantly the genetic fitness of the wolf population," Vucetich said. "Every winter, we try to get an impression of what it is that the wolves are doing. And the more time you have, the better you can do it," he said. This year's study may be particularly important because of the newly-introduced wolves, all of which are female. Because of the change in wolf-moose ratio, the team also planned to put radio collars on some moose for first time in decades, Vucetich said. Doing so is logistically complicated — involving two additional helicopters and additional staff beyond the half-dozen typically involved — so "there is a non-trivial risk that that effort to collar moose would be just scrubbed this year," Vucetich said. The Park Service has plans to relocate additional wolves from Ontario to Isle Royale this month. Alexandra Picavet, communications chief for the National Park Service Midwest Region, said in a statement that because the effort requires Park Service employees and facilities, it is on hold "while there is a lapse in funding for the National Park Service." If it doesn't happen this winter, it will be pushed back to the fall, Vucetich said. Spring and summer are off the table because, among other reasons, wolves have pups in the spring, and Isle Royale is open to visitors in the spring and summer. Another few months without new wolves might seem minor in the big picture, he said.